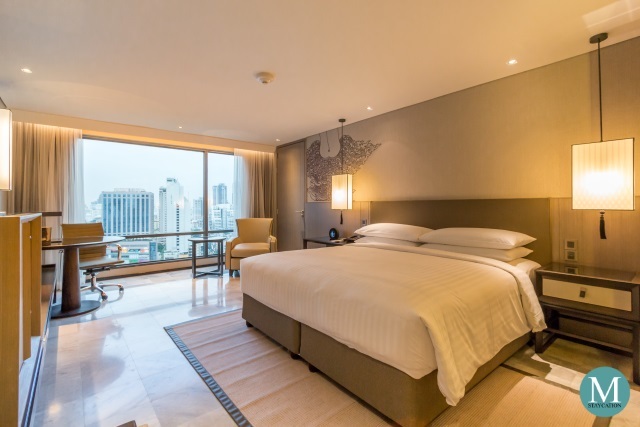 The Deluxe Room is the lead-in guestroom category of Bangkok Marriott Marquis Queen's Park. 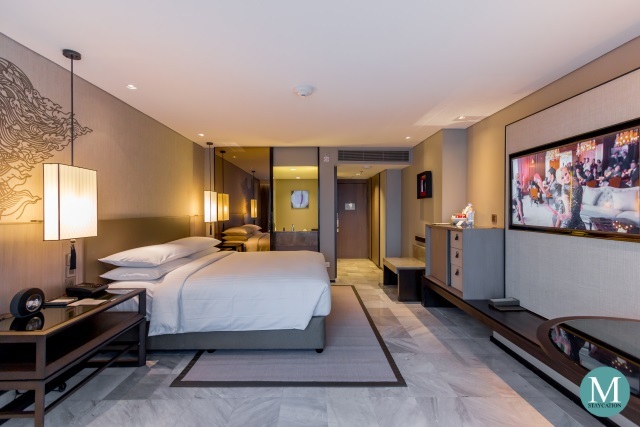 The 32 square meters room features a spacious living space with Thai-inspired design elements coupled with state-of-the-art entertainment and connectivity amenities. Plenty of daylight flows into the room through the floor-to-ceiling window, keeping the interior of the room bright during most times of the day. 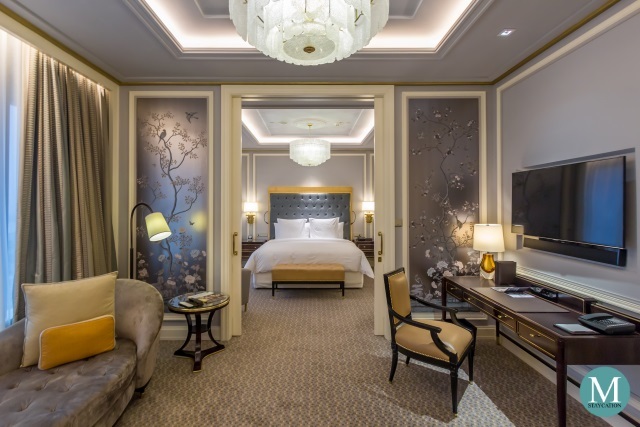 One of the recognizable features of the room is the wall art depicting Kinnari, the mythological half-woman half-bird creature in Thai Buddhist mythology. 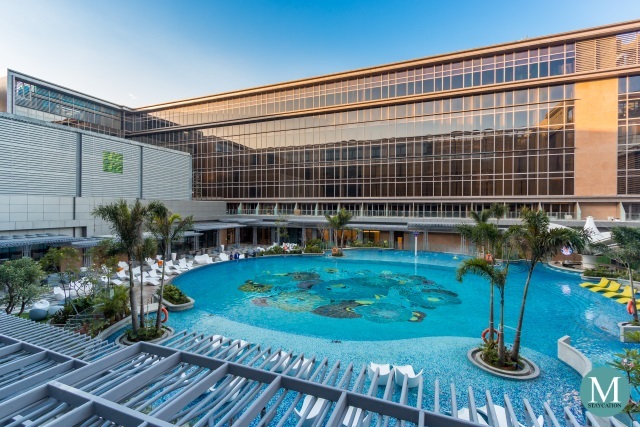 Guests staying in a Deluxe Room will enjoy an overlooking view of the outdoor swimming pool with partial views of the city and of the nearby Benchasiri Park. 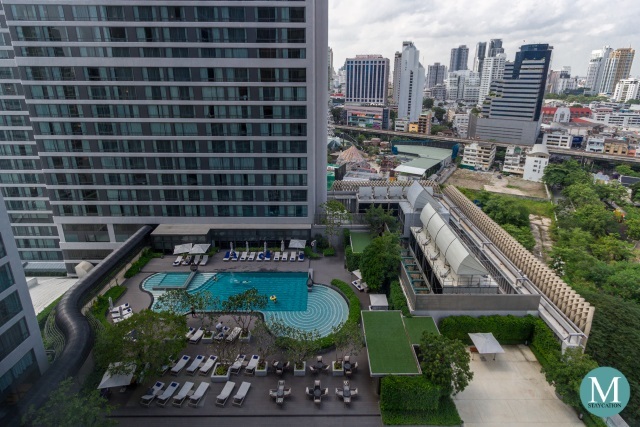 Bangkok Marriott Marquis Queen's Park belongs to the new generation Marriott properties which guestrooms are no longer furnished with an executive writing desk. Instead, guests are provided with a spacious dinner table which can also function as a work station. 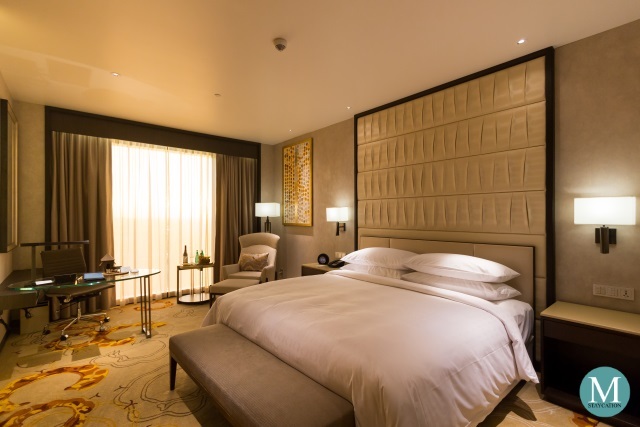 The Deluxe Room is also equipped with a Smart TV which can connect to your mobile phone to mirror the phone's screen to the television's screen. Streaming of videos is made possible by the high speed internet connection available inside the room. There's also ample power outlets conveniently located beside tables. International travelers need not to worry because all power outlets are fitted with universal sockets. 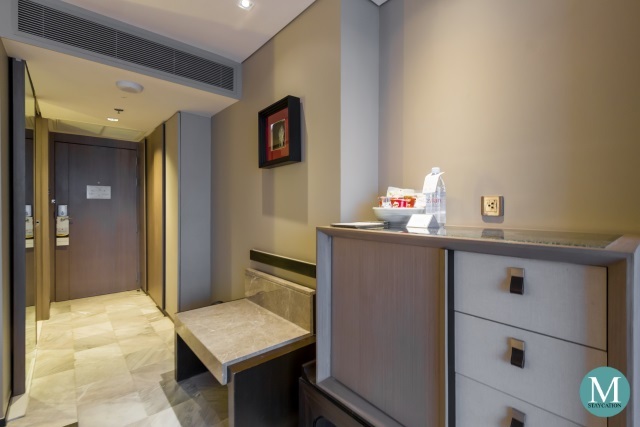 The Deluxe Room is also equipped with a mini refrigerator and an electronic kettle. 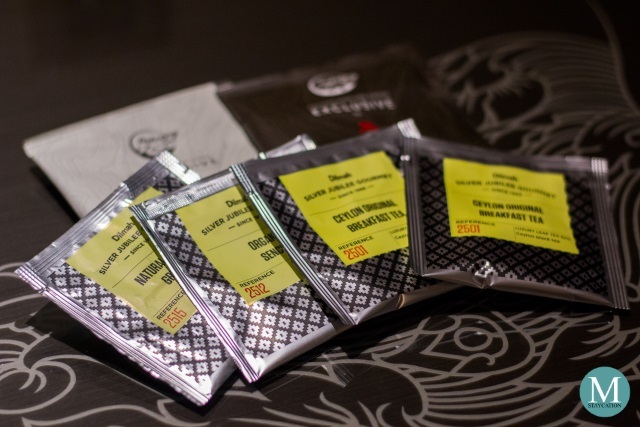 Guests are also treated with special edition Dilmah Silver Jubilee Collection of tea and ground coffee beans from Laos especially blended and roasted for Bangkok Marriott Marquis Queen's Park. Whether on a holiday or a business trip, one of the things that I look forward to when staying in a Marriott hotel is the bed. The combination of a comfortable mattress, high thread-count linens and plush pillows are the perfect formula for a good quality sleep. 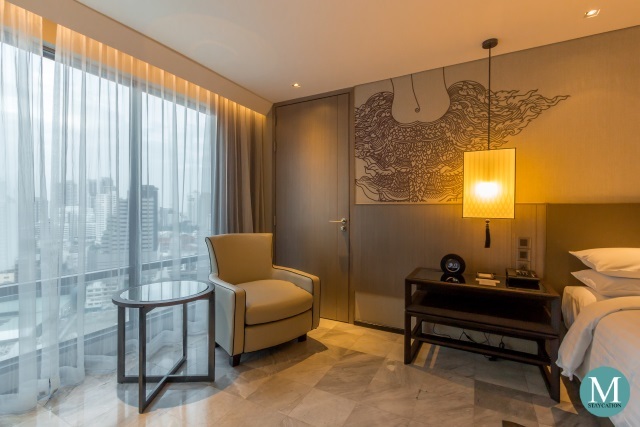 Long staying guests will be assured of enough storage space for their clothes during their stay at Bangkok Marriott Marquis Queen's Park. Iron and ironing board are also provided so you can always look your best whenever meeting friends or business associates in Bangkok. For your comfort, bathrobes and bedroom slippers are also provided per guest. You can request for new ones anytime by calling housekeeping. 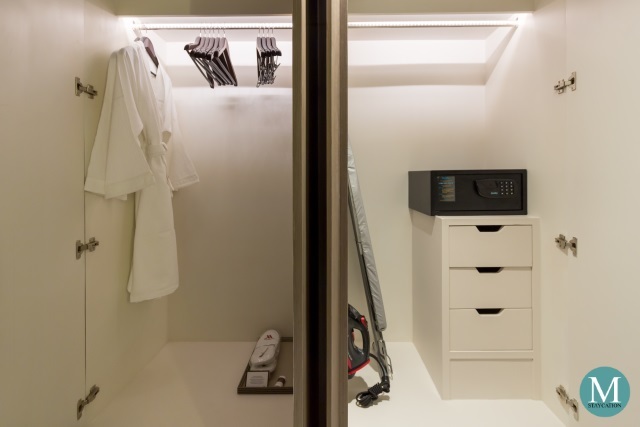 The closet also stores an electronic safe where you can keep your valuables as well as electronic gadgets. The safe is big enough to fit a laptop and a DSLR camera. 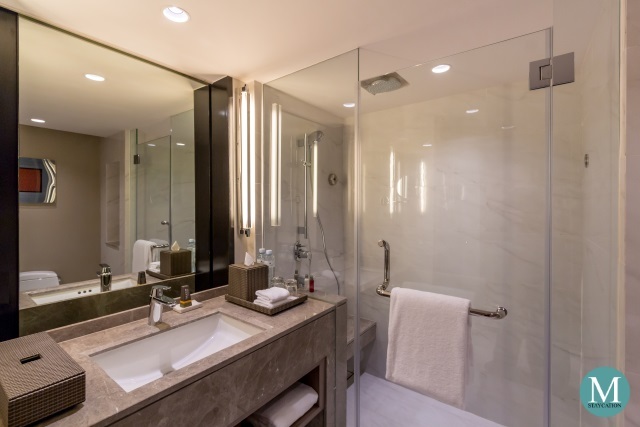 The bathroom was smartly designed so that the space is maximized while keeping the comfort of freely moving around the confines of the walls of the bathroom. There is a single basin with enough space on the countertop for your personal hygiene items. The walk-in shower features a rainfall shower-head and a handheld shower-head. Hot and cold water are available anytime of the day. Water pressure was consistently strong. 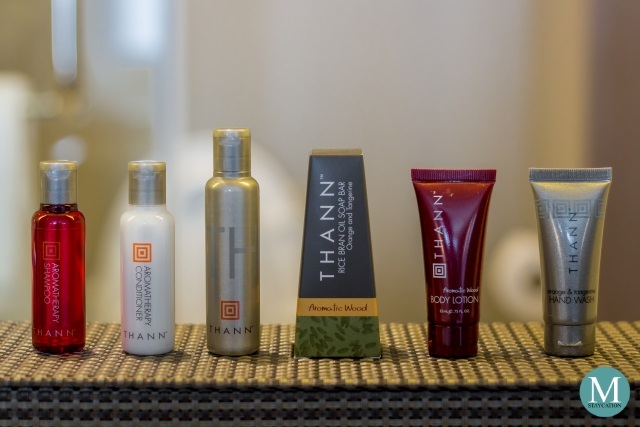 Just like in any Marriott hotel property in Asia Pacific, guests are provided with Thann-branded body and bath amenities, including shampoo, conditioner, shower gel, hand soap, hand wash gel and body lotion.